As with the visual arts, the Nazis aimed to demonstrate the difference between good “German“ music and “degenerate“ music by staging major cultural events. To this end, they organized the Reichsmusiktage [Reich Music Days] in Düsseldorf from May 22-29, 1938. This week-long event included concerts and lectures that presented ideologically and ethnically “pure” music. It was accompanied by the “Degenerate Music” exhibition, which opened on May 24. The show was similar in concept to the “Degenerate Art” exhibition – its main purpose was to document the work of artists who had been defamed by the Nazi regime since 1933. The Reichsmusikprüfstelle [Reich Music Inspection Office], which was part of the Reich Propaganda Ministry, had drawn up a list of “degenerate” artists and their works for this purpose. The exhibition covered all areas of music, from composition, performance and criticism to musicology and promotion. Examples of “degeneracy” were found in classical music in composers such as Alban Berg, Paul Hindemith, or Igor Stravinsky, and in the genres of jazz and swing in general. The exhibit’s main organizer was Privy Councilor Dr. Hans Severus Ziegler, who was director of the Weimar National Theater. Ziegler was also head of the Cultural Office in the Gau of Thuringia, and had carried out “cleansings against cultural Bolshevism” in Thuringia even before 1933. The visual component of the exhibition consisted of photographs, portraits, paintings, caricatures, and posters intended to illustrate the “subhuman” character of the featured musicians and the inferiority of their works. One such example appeared on the cover of the exhibition guide (below). 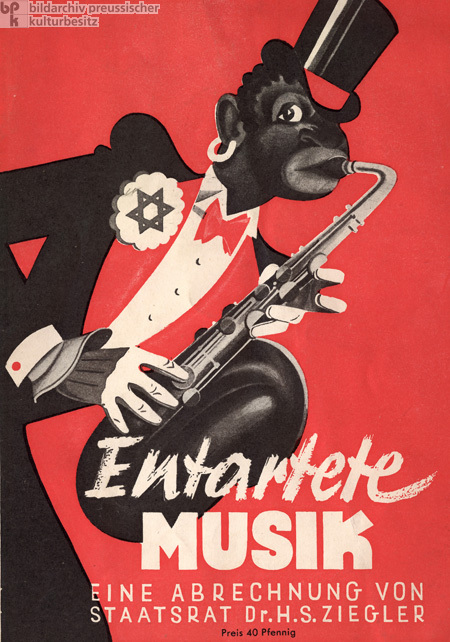 The image was based on the cover sheet of Ernst Krenek’s opera “Jonny spielt auf” [“Jonny Strikes up the Band”] (1925-26), but replaced the carnation on the African-American saxophonist’s lapel with a Star of David. The opera had been banned in 1933, and Krenek, an Austrian, had emigrated to the U.S. after the annexation of his country [Anschluss] in 1938. The exhibition remained on view in Düsseldorf until June and subsequently traveled to other cities along with the “Degenerate Art” exhibit. As of 1938, the Reich Music Days were supposed to take place annually, but they were canceled after the beginning of the war in 1939.